jadi kesimpulanya disini teman teman memiliki data,, smahalnya aset,,, yg bs diperjual belikan ke banyak..
berutung bukan? nah sekarang pertanyaanya kita sudah sejauh mana mencintai allah agar cinta kita berbalas? 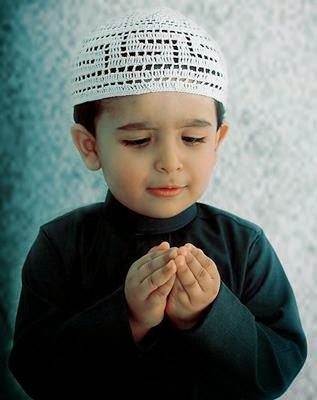 inilah ciri ciri orang yang dicintai allah swt..
11. Orang-orang yang hatinya senantiasa sedih namun tetap bersyukur kepada ALLAH subhana wa Ta'ala . Adakah diantara kawan-kawan termasuk salah satunya? In the 1960s, a cultural revival was thriving in the beach neighborhood of Ipanema. 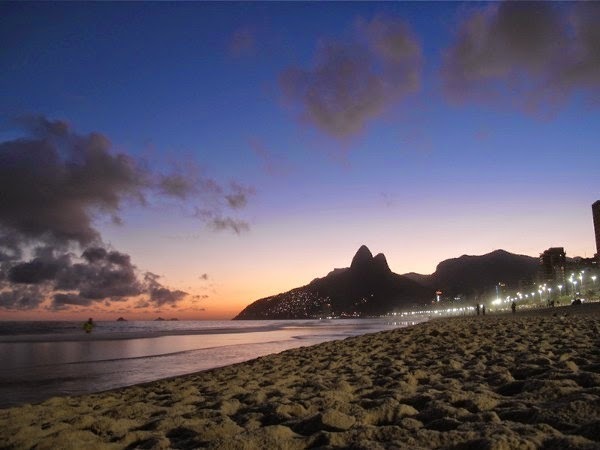 Artists, poets and musicians would gather in Ipanema to celebrate its world-class beauty and vibrant culture. In writing an ode to this neighborhood, composer Antonio Carlos Jobim and lyricist Vinicius de Moraes penned a song about a beautiful young girl who walked the streets of Ipanema each day on her way to the ocean. Nearly fifty years after it was written, “Garota de Ipanema” (“The Girl from Ipanema“) remains a cultural icon of Brazil, just as the Ipanema neighborhood remains a cultural epicenter of Rio de Janeiro. The streets of Ipanema and the beach at their end are celebrated as some of the world’s most beautiful, with the Travel Channel calling Ipanema the sexiest beach in the world. Across town from Ipanema is another cultural hotspot, the Lapa neighborhood of Rio de Janeiro. Located in Rio’s urban center, Lapa is host to 18th century architecture, a growing arts community and an active nightlife scene. Amongst Lapa’s most recognizable landmarks is the Arco de Lapa, a series of raised aqueducts constructed in the mid 1700s. 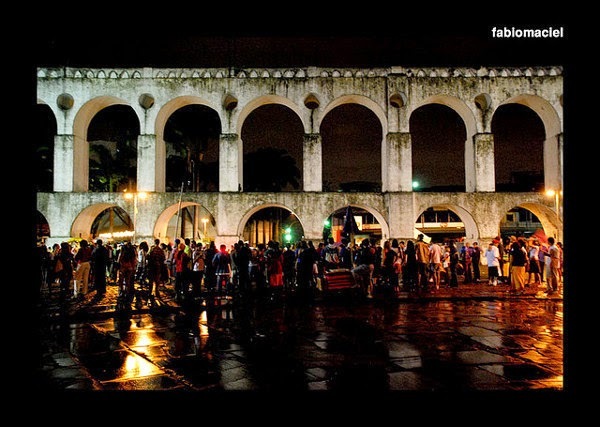 On Saturdays, a street party is held adjacent to a section of the Arcos in Lapa, a weekly celebration for natives and tourists alike. Another point of interest in Lapa is the stunning-yet-strange Metropolitan Cathedral of Rio, a brutalist concrete cone that stretches 80 meters into the air. Far beyond the shinier parts of Rio are the famed “favelas” of the city, or large shanty towns that are home to Rio’s poorest. If you’re comfortable with your Portuguese and your self-defense, a guided visit to the Painted Favelas of Rio reveals a sight to behold. A duo of artists worked with a few favelas in Rio to engender new pride in their homes. 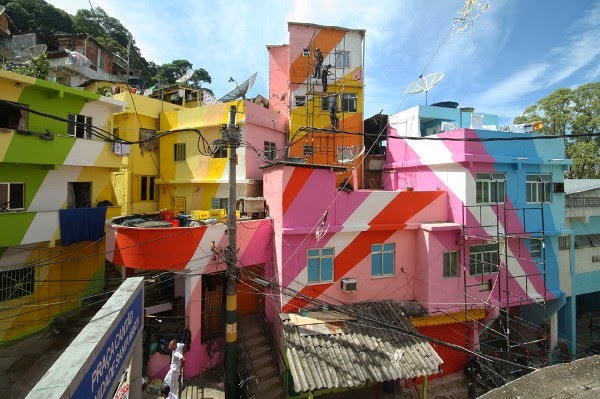 Jeroen Koolhaas and Dre Urhahn worked with the locals to paint large sections of favelas into bright, colorful works of art. The result was a down-on-its-luck neighborhood that had been transformed by art into a place of pride for its inhabitants. Enter at your own risk, but be prepared for some truly inspirational, transformational art. Germany's optimism appears warranted: whereas unemployment in the United States rose during the recent economic recession, from 4.6 percent in 2007 to 9.0 percent in 2011 (seasonally adjusted), in Germany, it fell, from 8.5 percent to 7.1 percent. For the first time since 1992, fewer than three million Germans are unemployed. By the time U.S. President Barack Obama was telling Americans in his January 2011 State of the Union address that the United States needed to double its exports, Germany had quietly become the world's second-largest exporter (after China). Indeed, Germany's exports have contributed two-thirds of the country's economic growth over the past decade and have driven its GDP per capita to increase faster than that of any other major industrialized country. When it comes to boosting exports, of course, the need to maintain or even increase the size of the manufacturing sector, in particular, has been an article of faith in major developed countries for decades. Politicians and voters alike believe that having companies that "make something" is a key element of economic success, in part because manufacturing jobs have historically paid above average wages. For its part, Germany embraced manufacturing, and much of its economic success is thanks to that decision. Germans credit both their public and their private sectors for their country's success. Germany's government, particularly under Gerhard Schröder, who was chancellor from 1998 to 2005, played an important role in the country's economic growth. In early 2005, Schröder pushed through parliament a massive reform program called Agenda 2010. Doing so was politically costly for the chancellor. His party suffered a major loss in that spring's regional election, and when Schröder called for an early general election in the fall that year, he was defeated. But Agenda 2010 survived and successfully rolled back the German welfare state by, among other things, paring unemployment benefits to encourage work, relaxing stultifying regulatory practices, and forging a grand bargain with labor unions whereby the unions agreed to hold down wages and the government assured job security for workers. This greater job security was afforded in large measure through a "short work" scheme: workers' total number of hours were reduced to avoid layoffs, and the government covered part of their lost salaries. Approximately 1.5 million Germans were enrolled in the program at its peak, in May 2009, at a cost to the government of 4.6 billion euros that year alone. According to a 2009 report by the Organization for Economic Cooperation and Development, the program saved approximately 500,000 jobs during the recent economic recession. Of at least equal importance was the role of the private sector, especially the innumerable small and medium-sized manufacturing firms known as the Mittelstand. These companies combine the advantages of stable family ownership with a focus on producing sophisticated goods that emerging markets cannot easily replicate. As Germans like to say, "We make the thing that goes inside the thing that goes inside the thing." Although family-owned businesses can be a mixed blessing, of course -- they are subject to familial strife and succession problems -- the overall success of these companies is widely acknowledged. The Mittelstand now employ millions of people and seem to put a higher priority on employing Germans than do publicly traded multinational giants. Many Germans believe that since the Mittelstand are privately owned, they focus more on long-term growth than short-term profits. A significant portion of Germany's industrial success can be traced to two manufacturing sectors. The first, heavily dominated by the Mittelstand, includes companies that build the sophisticated machine tools that emerging markets need as they develop their own manufacturing capabilities. This might sound like selling arms to one's adversary, but it has worked well for Germany. 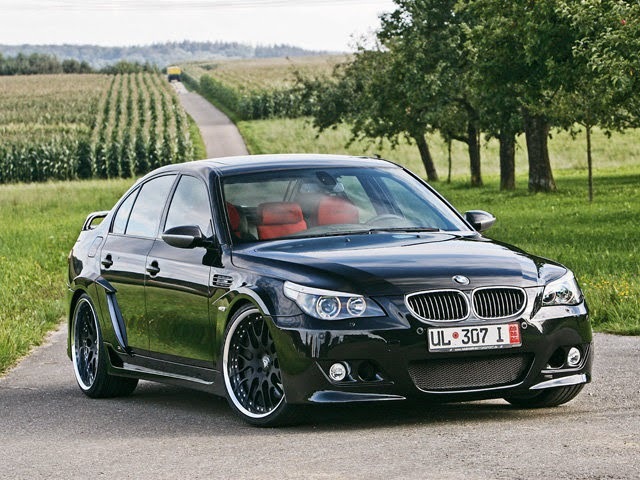 The second sector includes Germany's marquee auto brands -- BMW, Daimler, Porsche, Audi, and the like. Automakers are, of course, central to the German economy, composing about 20 percent of GDP. In particular, high-end cars have become hot commodities for affluent consumers in booming new markets, such as China, which alone accounts for 25 percent of BMW's global profits. Some have warned that Germany's economy is overly export-dependent and vulnerable to the vicissitudes of the global economy, but the country's success as an exporter has created a virtuous circle that has instead strengthened the German economy. More exports have generated more profits and created more jobs, and these in turn have fueled domestic demand for consumer products. Germany's exports in February 2011 were 21 percent higher than a year earlier, and its imports were 27 percent higher. Although Germany's public and private sectors deserve enormous credit for their accomplishments, the reasons for the country's economic triumph are more complicated. Not all of Germany's economic policies -- especially its decision to hold down wages -- have had positive effects. According to a December 2010 International Labor Organization report, real earnings in the country dropped by 4.5 percent over the past decade. In other words, even as Germany was selling more and finding innovative ways to keep more of its citizens employed, it was failing to provide most Germans with an improved standard of living. And inevitably, wages can be held down only for so long in an otherwise healthy economy. Accordingly, real wages have begun to rise -- by 1.5 percent in 2010 -- marginally eroding German competitiveness. At the same time, the short-work program adversely affected productivity: between 2007 and 2009, GDP per employee fell by five percent in Germany while rising by two percent in the United States. The tension between maximizing productivity, or competitiveness, and maximizing employment is something almost all developed countries face. In some ways, Germany and the United States are on opposite ends of this spectrum. Germany maximized employment, and its GDP suffered; the flexible U.S. economy tends to maximize productivity, and it has a higher unemployment rate as a result. Meanwhile, the introduction of the euro in 1999 quietly brought Germany another advantage: it fused the country to others whose competitiveness, as measured by the cost of each unit of labor, had stagnated, particularly Greece, Ireland, Italy, Portugal, and Spain, but also France. Meanwhile, since 1999, Germany's competitiveness has increased by nearly 20 percent. Germany wins more business worldwide when it competes against other eurozone countries to sell its exports, and it even outperforms them in their home markets. About 80 percent of Germany's trade surplus comes from its trade with the rest of the European Union. The eurozone's weak economic performance and the simmering sovereign debt crises in several peripheral eurozone countries have kept the value of the euro well below what the deutsche mark would be worth today if it still existed. (According to some estimates, if Germany abandoned the euro, its currency would immediately appreciate by 30 to 40 percent.) This gives Germany an enormous competitive trade advantage over countries with their own, more expensive currencies, such as the United Kingdom and the United States. The economic stimulus from the undervaluation of the euro has been so powerful that the biggest economic worry in Germany today is that the economy will overheat and trigger inflation. Whatever its flaws, the German model shows that a developed country can remain competitive even in a world where new economic giants, such as China, India, and others, are emerging. To accomplish this requires determined political leadership -- of the kind that Schröder displayed in 2005 -- as well as figuring out the right ways to exploit a country's comparative advantages. Germany has succeeded in large part through its focus on specialized manufacturing and marquee brands. Given the vastly lower labor costs and quickly rising productivity in the developing world, emphasizing the top of the value-added chain is the surest way forward for advanced economies. In 2009, General Motors' labor costs were $55 per hour in the United States, $7 in Mexico, $4.50 in China, and $1 in India for the same types of work. Although productivity in Mexico, China, and India was lower than in the United States, the difference in wages more than compensated. As the German example has shown, superior products, and at least some with significant brand recognition, can buoy an entire economy. Even though locally produced Buicks are a huge success in China, the United States may not have auto brands with enough marquee value to compete widely for China's high-end consumers. But it does have an enviable global edge in several high-growth sectors, including social media (Google and Facebook), entertainment, technology, and finance. The United States will also have to be realistic, however. Given the high rates of investment in the developing countries and the fact that these countries' workers are becoming increasingly skilled, even the smartest government policies cannot keep the U.S. economy's share of global manufacturing exports from declining. This will mean more human dislocation, which Washington should work to ameliorate. Creative approaches along the lines of Germany's Agenda 2010 would help. Although the short-work program has had its disadvantages, by spreading available work across a broader pool of laborers, it prevented some of the wrenching social costs, such as high unemployment, that the United States has recently experienced. And just as Germany has profited from its focus on producing highly trained engineers, the United States would benefit from better technical training programs. The United States may also find inspiration in Germany's growing focus on encouraging new industries, such as the alternative energy sector. In typical German fashion, its green-energy companies manufacture mainly niche products, such as components for solar panels and machine tools for building parts for solar devices. Thanks to new laws encouraging investment in green energy, last year Germany's green-energy industry received $41 billion in new investment, compared with $34 billion in the United States. Such government interventions can, of course, create a slippery slope, with all the attendant risks of poor execution and management. But at least some of these risks can be mitigated if the government insists that its capital be used to leverage private investment. Germany has lived off exporting to other markets for a long time. The United States would benefit from nurturing such an orientation in its own economy. In Germany, even the Mittelstand business owners are international. Many have lived and worked outside of Germany and speak excellent English -- the global language of business. Obama's rhetoric about doubling exports represents at least a first step toward achieving greater U.S. focus on world markets. The challenges of globalization for developed countries -- and particularly for these countries' workers -- are real. Germany's success as an exporter of niche manufactured goods has not been unambiguous, but on balance, the German example shows that a combination of good private-sector performance and a sensible policy approach can encourage real growth, even in the West. Absent a more thoughtful approach, U.S. industry is likely to find itself under unrelenting pressure as globalization inexorably grows. We love pizza, but usually try to restrict our love for pizza to just once a week. Friday night is “pizza night” in our house. My husband happily enjoys the same pizza every week, which is a Margherita pizza topped with arugula and prosciutto after it is cooked. I prefer to play around with my pizza toppings, often changing the ingredients along with the seasons. Although we are lucky enough to own two backyard pizza ovens, one here in North America, and one in Umbria, you can make great pizza in your oven as well. In my ongoing challenge to make our weekly meals healthier, I have been playing around with the dough, incorporating whole grain flour in with my pizza flour. We love our old pizza dough which is both tender and crisp, so I found that using all whole wheat just made too tough of a crust. It took a few tries, but I am now using 50% white wheat flour, and 50% pizza flour (also known as tipo “00″ in Italy which is similar to cake flour). In the US I buy Caputo pizza flour which works the same as the Italian tipo “00″. I also use one cup of white wine along with the water, which helps to create a tender dough. 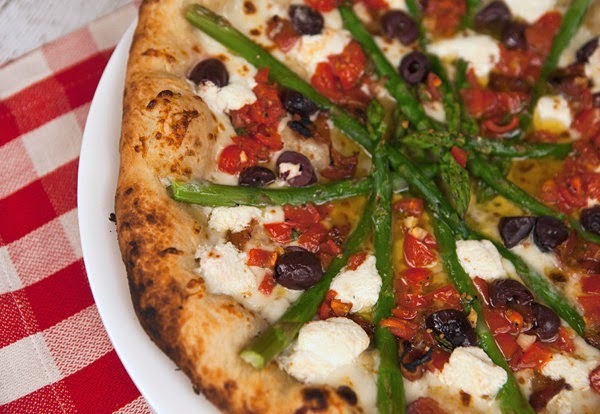 My choice of toppings for this pizza were influenced by the season, choosing a combination of asparagus, goat cheese, Kalamata olives, and fresh tomatoes. This dough recipe makes 4 to 6 pizzas depending on the size, so you will have dough leftover. Simply weight the dough into equal 8 ounce balls, and wrap the unneeded balls and freeze for future pizzas. 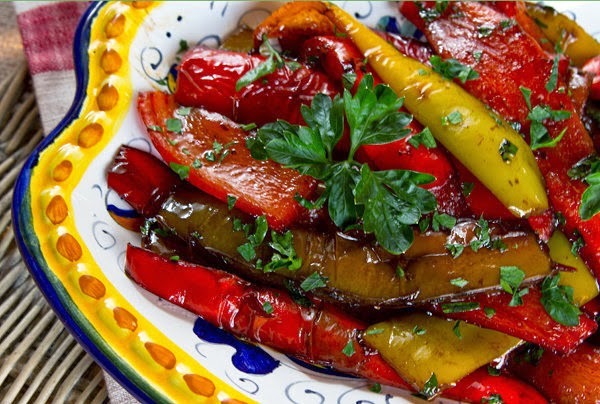 I usually have some roasted sweet peppers in my refrigerator all the time that I use as an addition to my antipasti tray, in sandwiches, or to toss into my pasta dishes. I recently decided to try something a little different, and simply fried pepper strips, then added some garlic and balsamic vinegar and they turned out delicious. I’ve tasted peppers cooked this way from time to time but for some reason I just never made them myself at home until recently. The balsamic vinegar really adds a nice depth of flavor and a little extra sweetness that turns simple peppers into something special. These peppers would be great on an antipasti tray, or served with grilled or roasted meats and sausages. I also think these peppers would be amazing served along with grilled sausages on a bun. 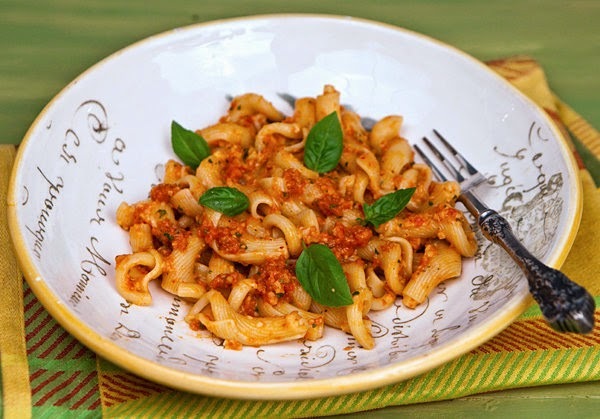 I’ve seen this tasty Sicilian pasta dish with many different variations, but almost all contain almonds along with tomatoes ground into a type of pesto for the sauce. Though I prefer making this dish with fresh, ripe, garden fresh tomatoes, when they are out of season I find a combination of good quality canned tomatoes along with sun-dried tomatoes work well. Because I had some leftover Sun-Dried Tomato & Chili Pesto in my refrigerator, I used this, but sun-dried tomatoes in oil will work well also. This sauce is also delicious on grilled seafood or chicken as I found using up some leftover Trapanese sauce the next day. Lightly toasting the almonds first before making the pesto really brings out the almond flavor, so do not be tempted to skip this step. I like to make the sauce a few hours before I need it as the flavor of the sauce improves as it sits. You can use a long pasta such as spaghetti, or a short twisted pasta as I have shown in my photos as both work well with this sauce. 2012. Tema Jendela Gambar. Diberdayakan oleh Blogger.